Faire Isle goes so FAST! from friday afternoon ive already gotten all the way through to the thumb opening done. I just cant put it down, i want to see the pattern come out so i just keep going and going. 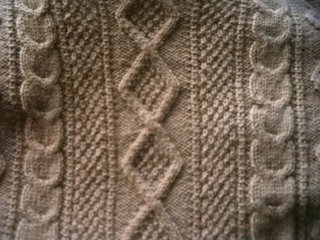 Im snowed in today so that leaves for a lot of knitting time. I didnt think id be able to finish the pair in the 2 weeks, but now i definitely think ill be able to. I hope =). Pictures later. after my sock exchange socks i was still in a sock mood....i cast on for a pair of ankle toe up socks from a ball of random sock yarn i had, finished one in two days and have the toe done of the second one so far. I only had one skein of it - 50 grams - so ankle socks were the only thing i could do. I have another lone ball of sock yarn in a different color that ill do the same thing with after. 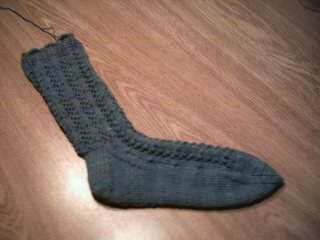 The sock i was doing before the sock exchange i got more done of, im working on the gusset now, but the stitch pattern is pretty boring and im not sure i like the way it looks so i dunno what im gonna do with it. i would hate to rip it out but i might end up doing that. 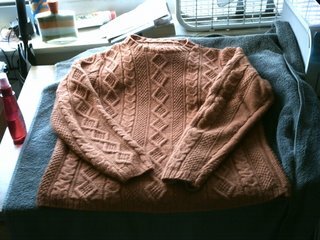 the two sweaters im working on have grown about an inch each from the pictures that are further down, ive been slacking pretty bad on them. The orange one only needs the front and back, ive been working on it for like 6 months - it should definitely be done by now. 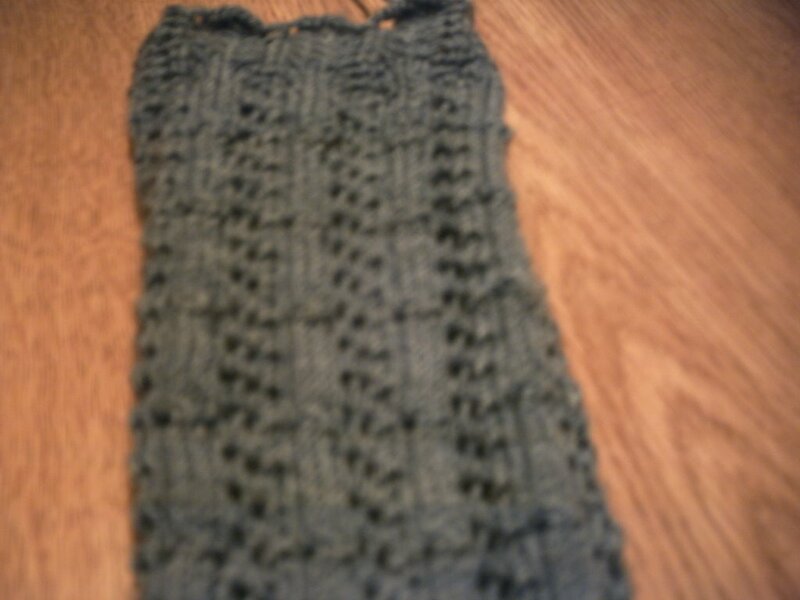 The blue one is relatively new but its bigger yarn and size 6 needles so its going faster then the orange one. Ill post pictures next week of everything next week when im home. while looking for a store in my area that sells lorna's Laces (for my sock pal) i came across The Yarn Barn...its about 10 minutes away from campus and its great! i didnt have much time to look around but they appear to be very well stocked, Cascade, Rowan, Jager, Koigu, Lornas Laces, Debbie Bliss...you name it. They also take credit card which is a huge plus for me - the store near my house doesnt, and i tend to not shop there because of that (and their lack of stock). The only thing that i was a little disappointed in was the lack of colors they had of Shepard Sock - and what they did have they really only had one skein of each color - the color i wanted had two skeins - thank god. But i will definitely be going back to this store again, hopefully when im not pressed for time, i didnt even get to look at their books! I got a solid color, denim and a set of Brittany Birch 5 inch US 1 DPNs - im loving them so far. the length is amazing and the feel? wow. they are like the perfect in between for me of metal and bamboo - i always feel like im going to break my bamboo ones, and the metal ones are too rigid for me, esp in DPNs - i like them to bend a tiny bit. I had plans to make a gorgeous pair of lace socks that i had a pattern for, but when i was working it the numbers didnt work out right and while i could probably work the numbers out i think it would be a little too time consuming, esp as im worried about the deadline as it is. 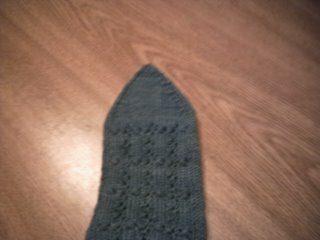 So im working on a pair of very nice lace socks from Vintage Knits. Im a little into the leg atm, and its looking good so far. I got the solid color for the more complicated lace to show up and with this more simple lace i kinda wish i had gotten a colorway with a little bit more variation, but they will still look great.